On the first weekend of its spring season, the Tufts women’s tennis team went 1–1, falling 6–3 to Middlebury at home on Saturday and defeating Wellesley 9–0 in an away match on Sunday. On Sunday, the Jumbos visited the Blue for their second match of the weekend. Last time the two teams met, on April 5, 2017, Tufts defeated Wellesley 7–2 on the road. This time, the Jumbos were even more decisive in their victory, recording a resounding 9–0 win over the hosts. Tufts got wins from all three doubles pairs to enter the singles matches with a 3–0 lead. The Jumbos were led by senior co-captains Zoe Miller and Lauren Louks, who recorded an 8–0 thumping of Wellesley first-year Michelle Buyer and junior Sojin Ki in the third position. Junior Mina Karamercan partnered with junior Otilia Popa in first doubles, while sophomore Kat Wiley and first-year Patricia Obeid joined forces in the second position. Both teams won their matches 8–4. In singles, Obeid played as Tufts’ No. 1 for the second day in a row. Despite being in the rare position of playing first singles during her first weekend of collegiate tennis, the New York native maintained excellent composure in recording two wins in as many days. Against Wellesley, Obeid cruised to a 6–4, 6–2 win over junior Justine Huang. Obeid discussed how important it was for her to stay focused amid the excitement of the weekend. Playing in the No. 5 singles spot, Wiley defeated Wellesley first-year Lily Chu in a decisive two-set match: 6–1, 6–0. Wiley’s experience of having played on the singles ladder as a first-year in 2017 was evident in her on-court confidence throughout the weekend. Despite the match against Wellesley being the team’s second of the weekend, Tufts did not show signs physical or mental fatigue, which is a testament to their careful preparation. Wiley believes that Saturday’s loss to the Middlebury Panthers actually helped the Jumbos on Sunday, since it caused them to play with even more determination and purpose. 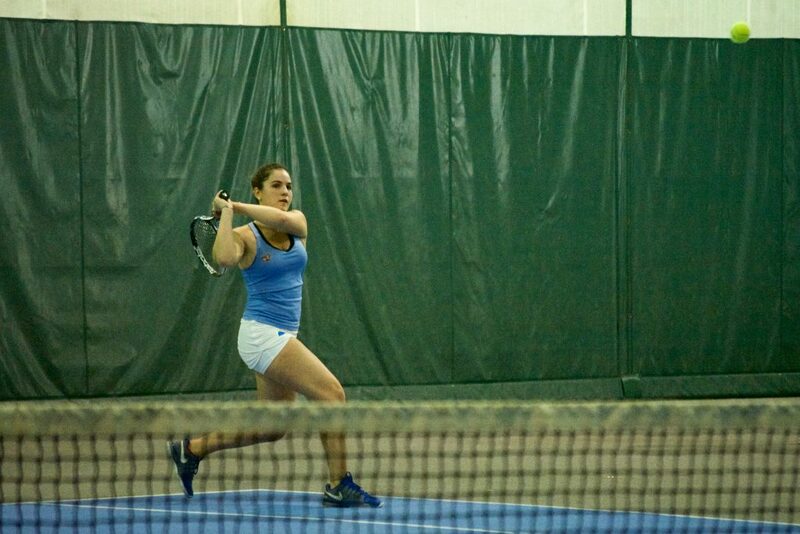 On Saturday, Tufts opened its spring season with a home match against Middlebury. After falling to the Panthers 9–0 on the road last season, the match was an important early test for the Jumbos. In first doubles, Karamercan and Popa defeated the 17th-ranked pair of sophomores Skylar Schossberger and Katherine Hughes, 8–4, to give Tufts an early advantage. However, the remaining two doubles matches went in the Panthers’ favor, giving the hosts a 2–1 lead heading into singles play. Louks and Rose battled their opponents to the end but ultimately fell in a 9–7 nail-biter. Obeid and Wiley were the only two Tufts players to record wins in their singles matches, as Middlebury secured a 6–3 victory. Playing first singles in her spring debut for the Jumbos, Obeid fought relentlessly to defeat Hughes 7–6, 6–4. Obeid’s mental toughness was especially evident in the second set, when she came back from a 4–0 deficit, winning six straight games to clinch the match. Wiley defeated Schossberger in straight sets, 6–2, 6–2 in the fifth position, but Tufts failed to record any other wins. Louks fell in three sets (4–6, 7–6, 6–3) to Middlebury junior Christina Puccinelli, while Tufts first-year Kiara Rose lost a third-set tiebreaker to sophomore Maddi Stow (3–6, 6–3, 10–8). Although the Jumbos were disappointed by Saturday’s outcome, knowing they had competed well against a top-level team left them optimistic about the rest of the season. This was the first time in recent years that the Jumbos have played matches before their annual spring break trip, and Miller believes that the team is heading to the West Coast on a positive note. Tufts’ next match will be played in Northridge, Calif. against Whitman College on March 18.